The day after the big christmas tree went up in Rockefeller Center, my Journalism 1 class and I entered the fray, venturing into the 30 Rock building for a tour of Dateline NBC. 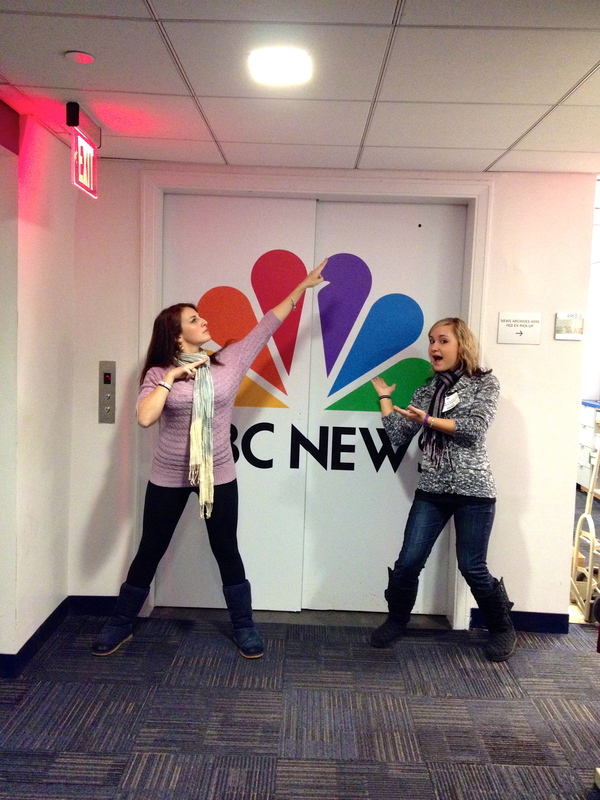 My pal Allison Orr, a senior producer on the show, took us to visit some of the NBC sets including Saturday Night Live, Late Night with Jimmy Fallon, and Dr. Oz. Then we got to explore the Dateline offices and while we were doing so, Chris Hansen emerged into the hallway to talk with us and pose for photographs. Talking to the “Catch a Predator” anchor was clearly the high point of the trip for the students. We also got time to meet with Allison and learn about her journalistic process. Afterwards we went out for pizza, paid for by a Student Engagement Grant from Purchase. A great trip. Lots of fun. The producers of the new Trisha Show reached out to me to see if I wanted to bring a group of journalism students up to be in the studio audience of the new show. The show organizers drove us from campus to the studios in Stamford, CT and back home again, fed us pizza and even paid some of the students $25 to stay and be in the audience of a second show. They also gave us a check to go towards a student group of our choice – and we chose thepurchasebrick.com. Host Trisha Goddard is being branded by NBC as the next Oprah. I don’t know if she’ll make it, but the experience was an eye-opener for the 50 students who attended. We got to see the making of this kind of media phenomenon up close. We had a lot to talk about afterwards. This was a new class and it turned out to be a great one – so we had a party to celebrate. In one short semester the class created their own bogs, learned to capture audio and edit it on Audacity, shoot video and edit it on Final Cut Express, shoot photographs and make audio slideshows, and harness social media to promote their work. We all worked really hard, so, for our last class we had a screening of their final multimedia packages and did a pot-luck to celebrate. Melissa Torres brought her now-famous “Slutty Brownies,” which we had learned about in her blog. Vanessa Cavanagh brought in delicious bean dip. Sam Snowden baked the most adorable heart cookies. Rebecca Kaplan brought in vegan cookies. Laura Romero brought in some real food in the form of pasta. There were lots of other delicious nibbles. And Lisa Nguyen brought in her camera and Nancy Kane, our tech guru, took a picture of the class (which I’ve used here.) 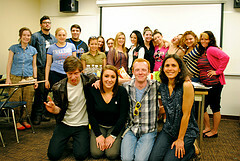 That’s Nicholas Shapiro, our class TA, front left, looking like a senior who knows he’s about to graduate. My features class braved torrential rain and blustering winds for our field trip to NY1. A good number arrived with their coats and backpacks soaked through and water dripping off their noses. It was worth it, nevertheless. We got an extended tour through NY1, which is based above groovy Chelsea Market in Manhattan and housed in a former cookie factory which the first Oreo was allegedly made. My old J-School pal Philip Klint, who has risen to become an anchor at NY1 Noticias, the spanish-language branch of NY1, talked to us right from his anchor’s chair and allowed us to watch him tape some of his teasers. The students also talked to the weather reporter, posed for photographs on a couple of sets and got to meet the internship co-ordinator. It was a fantastic trip, capped off by a collective cup of coffee and bowls of fries in a Chelsea Market restaurant afterwards. There’s nothing like walking into a television studio and onto the set of a news show to build enthusiasm for journalism. So when I discovered that one of the students in my Features class was the daughter of WABC-TV anchor Diana Williams, I jumped at the chance to take the class into Manhattan for a look see. We clambered over the set. We checked out the green cube where the weather reports are done. The students pretended to be anchors and posed for pictures. Then we sat and watched right inside the studio as Williams and co-host Sade Baderinwa anchored the 5 p.m. show. We even got a peek of the neighboring set of Live With Regis and Kelly. By the end, at least two of the students said to me: “I want to be a TV anchor.” One sad note: since my last visit to WABC-TV about a year ago, the staffing levels in the studio have dropped dramatically. All the bodies who used to help with the broadcast, including camera operators, have gone, and much of the process has been automated. I took two classes, Features Writing and College Writing, to The Maury Show. It’s not journalism, but it certainly is a media spectacle. 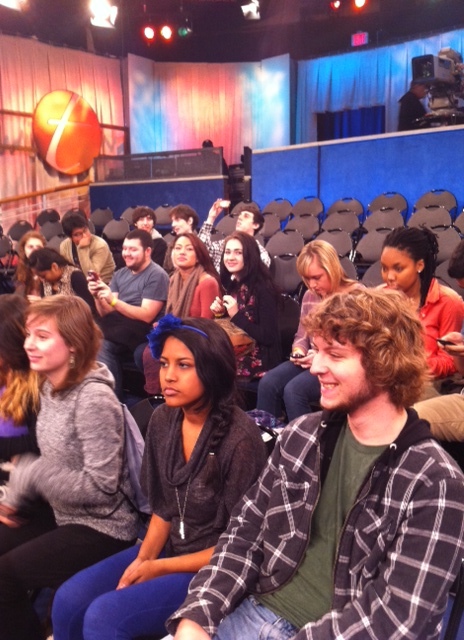 We had a tour of the studio, went back stage and were part of the live studio audience. It was extraordinary to watch the stage direction, both of the audience and the people on stage. The director told us that thousands of people call in to that show to get a chance to be on TV. It’s a multimillion dollar enterprise for NBC. It’s hard to ignore the exploitation. Yet, it was hard not to be impressed by the theatrical specatcle that brings to mind the Greek chorus and the thumbs up and thumbs down given by ancient crowds to warring gladiators. I took my Journalism 1 class to the Brian Lehrer show. We had a tour of their swanky new offices on Varick Street. We saw some of the WNYC stars, including John Schaefer of Soundcheck and Jad Abumrad from Radiolab, who were working in their glass offices as we strolled past on our tour of the building. We watched Lehrer at his microphone (doing the membership drive as it happens) and then had a lovely long Q and A session with him. To cap it all off we had a double celebrity sighting: Julia Stiles and Bill Pullman. I took my Journalism 1 class to ABC News, a field trip that was arranged by Prof. Virginia Breen who has been working at ABC News.com for the Spring semester. We saw the World News set, talked to editors and producers and had a thoroughly great time. Many of the professionals we talked to were concerned about the future of journalism but they still had lots of thoughtful advice and encouraging words for the students. A great trip. On the set with WABC-TV anchor Michelle Charlesworth. We were on the set and watched an hour of morning news. Afterwards, Charlesworth and her co-anchor and producer met with students to answer questions and share their career advice. Rolling Stone Magazine – Fall 2008. My Feature’s class of Fall 2008 was invited to visit ESPN radio by Peter Silverman, who has had a long career in radio and whose daughter, Hollie, was a member of the class. We all thought we were going to learn about sports radio, but Silverman showed us much more. We got to eyeball the working environment of many other radio concerns also owned by Disney. We were in the booth with the producers of the Hannity radio show and got to talk to a music DJ. Silverman also arranged for us to hear from folks in other parts of radio, including their internship recruiter.